Notepad is a simple text editor program which is used by the Microsoft Windows. It is a basic text editing program which enables computer users to create text files. Most of the person always want to know more tips and tricks. 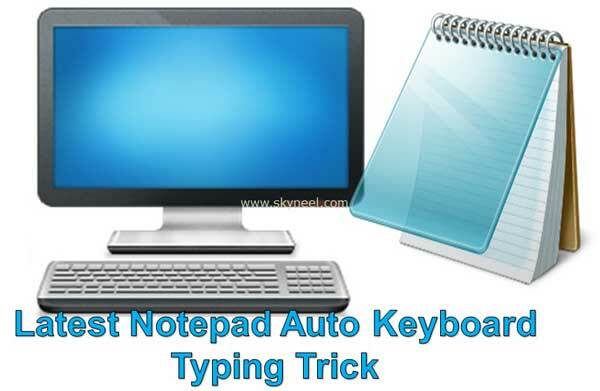 In this guide we have to discuss latest Notepad auto keyboard typing trick. All we know Notepad is a small and simple text editor program, which is used by most of the users to creating, editing, printing text files. But if you want some fun then you have to use given cool latest Notepad auto keyboard typing trick. When you click the file some characters or words are automatically start typing in the Notepad window. Most of the person don’t know about this trick, but if you are excited to do new then you have to use given trick. There are lot of tips and tricks available on the Internet. This trick allows you when you click a file it automatically start typing few characters or words without touch the keyboard. You can edit the characters or words as per you need. If you want to use given latest Notepad auto keyboard typing trick on your computer, then you have to take few given steps, have a look. Step 1: Open the Notepad text editor program either by clicking on the “Notepad” program or type “Notepad” in the run box and press enter. Step 2: After opening the Notepad window copy the given below code and paste in your active Notepad file. Step 3: Now save this file with the name of “skyneel.vbs” on your desktop or any other area (without double quotation marks). After saving the detail close the active file. Now you can see “skyneel.vbs” file icon placed on the desktop or your saved destination area. Step 4: Double click the “skyneel.vbs” file icon to start Notepad auto keyboard typing trick. Note: During double click on the “skyneel.vbs” file if you found an error message in the box then there is no need to worry. You just have to take given steps to edit your “skyneel.vbs” file. Step 1: Select the “skyneel.vbs”file and press right mouse button. Click on the edit option and remove all double quotation marks from the file and type them manually at the same places. Step 3: Now, save the updated detail in this file and again double click on the “skyneel.vbs” file. Now you can see given characters or words are automatically start typing the new opened Notepad window. I hope after reading give latest Notepad auto keyboard typing trick, you can show or share your extra ordinary knowledge with your friends, colleague or others. I hope this guide is useful for all those guys who are crazy to learn amount latest tips and tricks. If you have any suggestion regarding this guide then please write us in the comment box. Thanks to all.